What structures form from the melting of subducting plates? Plutons, Accretionary wedges, Deep sea trenches, Faults? This question does not appear to be about earth science, within the scope defined in the help center. The subducting plate never really melt. It just gets recycled into the mantle (the Asthenosphere to be more precise), which is in solid state. It is plastic and deformable enough to allow convection flows, but it is solid. Beside more mantle, something that forms from the subducting plate is magma. The water contained in the subducted slab (that was once ocean floor) can lower the melting point of the mantle and allow it to melt and form magma. The magma is liquid and less dense than the surrounding mantle, therefore it rises through it, and then through the continental plate. Once there it can create plutons, batholiths and feed volcanoes if it make it all the way to the surface. 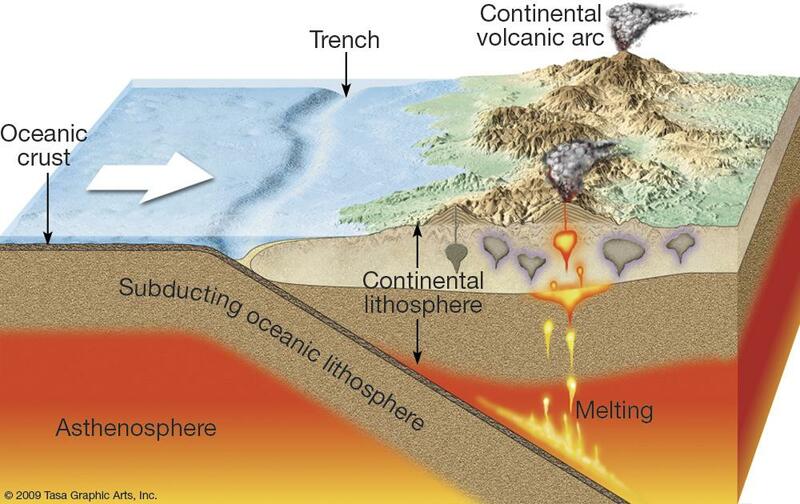 But what melts is mostly the mantle mixed with water from the subducting plate, not the subducting plate itself. Not the answer you're looking for? Browse other questions tagged geology geophysics plate-tectonics tectonics or ask your own question. How did tectonic plates originally come to form? Why are oceans so deep? How did the continental plates came above the oceanic plates? Does subduction of plates make them stretch and form the oceans? For slab rollback, what allows the subducting plate to begin descending at a steeper incline? Can the process of subduction flatten the shape of a subducting plate relative to the plate it's going under?